Simple? Check. Refined? Check. Boring? Absolutely not! 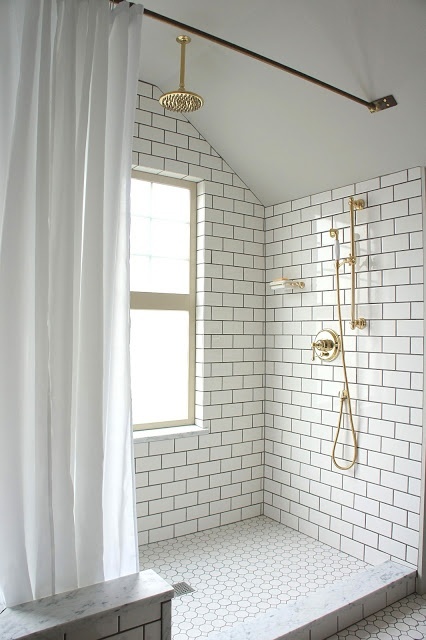 The subway tile walls, hexagon mosaic floors, and shiny brass fixtures bring to mind bygone eras, yet the overall feel is fresh, clean, and oh-so current. The sloped ceiling, bright window (either that window is made of frosted glass, or the house is in a peaceful locale far from peeping neighbors), and black tile grout give the otherwise traditional bathroom an edgy twist.